Looking for the perfect day-trip? Look no further than Bainbridge Island! It’s just a short ferry ride across the Puget Sound, and there are tons of places to enjoy. Here are some of my top picks to get your island adventure started! 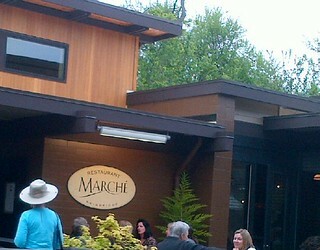 My fave new restaurant hangout is local chef and author Greg Atkinson’s Restaurant Marche! I recently had dinner there and it was d’lish ! The menu changes seasonally and totally embodies Greg’s signature NW style with its market-fresh island fare. Make sure you book your reservation in advance! Add a little extra spirit to your island adventure and check Bainbridge Organic Distillers. This family-owned business is getting rave reviews for creating Washington’s first USDA certified organic gin, vodka and whiskey. Make sure to check out their website for summer tour and tasting schedules. And before you head back across the water indulge your sweet tooth at Mora Iced Creamery. This super cute shop is a stone’s throw from Marche and offers tasty ice creams and sorbets. Of course, they cover all the classics from French Vanilla to Chocolate and Strawberry. For taste adventurers, there’s lots of creative flavors to tempt your palette as well. How about a scoop of Lemon Bar or elegant Sabayon – a Marsala wine custard? D’lish! Sangria is the perfect summer party drink! It’s a great way to test out various fruits with a d’lish, local wine. On Kathy Casey’s Liquid Kitchen, I share my Sake Sangria recipe! My Asian-inspired drink uses a medium-dry sake instead of wine. Local honey, ginger and lemongrass as well as fresh citrus and a plum play well with the sake. It’s a fantastic accompaniment to sushi! Seattle wine enthusiasts, here’s an event for you! 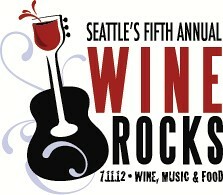 The 5th annual Wine Rocks event is set for Wednesday, July 11th from 6:00 – 10:00pm at Elliott Hall (Pier 66)! This not-for-profit event pairs fantastic wines with live music and food trucks for a unique wine experience. More than 35 Washington wineries, distilleries and breweries will pouring out libatious liquids. Tickets are only $35, so make sure you buy them in advanced! It’s almost Father’s Day! Time to show dear ol’ Dad how much you appreciate him. Maybe that means a special family breakfast or brunch, taking him out to a ball game, going for a long drive, or an afternoon on the patio with some good tunes and the grill turned up high. While the food is cooking and family and friends are gathered around, mix up a special drink for pops and those all gathered round (who can drink of course!). I have just the drink for him: Whiskey Spiked Iced Tea Punch. You might think punch is better suited for Mom’s special day, but this sunny-weather sip has a definite “manly” vibe about it. Packed with fresh juices, brown sugar, brewed tea, and some very masculine Jack Daniel’s, this punch is the perfect accompaniment to a fun day of showing Dad he’s number one. Punch is the perfect party cocktail! For a more-spiked interpretation, let guests add a little more whiskey to their individual drinks. For summertime sipping add in a few slices of fresh peach or nectarine. 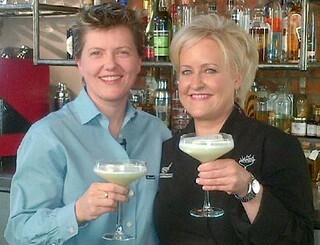 For more cocktail inspiration, check out my cocktail show www.liquidkitchen.tv. Add the ice water, juices, and brown sugar. Stir until the sugar is dissolved, add the whiskey, and chill until ready to serve. Serve in ice-filled glasses. Garnish as desired. Make this a libatious summer with Kathy Casey’s Liquid Kitchen™! Kicking off the 3rd Season of my cocktail show, I look back at a classic bar staple for a bit of inspiration. My Luxury Gin & Tonic is my take on the classic gin & tonic. A fresh lime squeeze and Martin Miller’s Gin play well with my Quick Infusion Tonic Bitters (made with Monin Bitters and an iSi whipper), then topped with DRY Soda’s Blood Orange Soda. For a truly luxurious feel, I finish it off with a Cucumber Lime Foam and a garnish of microplaned lime zest! One of the first delicious signs of summer is sweet, juicy strawberries appearing at the grocery stores and farmers markets! Of course, strawberries are the perfect treats – just eaten out of hand or piled high on shortcake or dipped in chocolate. Yum! But why not get a little savory with your strawberries this year. Local berries drizzled with balsamic glaze and a few twists of fresh-cracked black pepper make for a perfect balance of sweet and savory. Wanna try that combo in ice cream? Check out Molly Moon’s ice cream shop for their inspired balsamic strawberry ice cream! Strawberry & Spinach Salad with sweet walla walla onions, and my Poppy Seed –Ginger Vinaigrette is one of my favorite summer salad recipes. 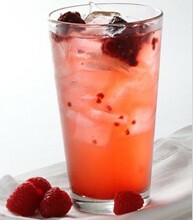 It’s light, refreshing and a great way to use those summer berries for a touch of sweet and tang. And don’t forget to muddle some in a summer- sipper like in my d’lish Strawberry Shag. It teams lightly-sugared strawberries with fresh basil! Shaken with vodka and lemon juice, this fresh cooler is perfect to start any patio party! You can substitute toasted hazelnuts for the almonds. This salad is also excellent as an entrée salad, topped with grilled chicken cut into strips and dollops of goat cheese. To make the vinaigrette, whisk the vinegar, ginger, mustard, honey, sugar, salt, and pepper in a medium bowl. Gradually whisk in the oil, emulsifying the vinaigrette. Stir in the poppy seed. Refrigerate for up to 2 days. To make the salad, toss the berries, spinach, and onion with the vinaigrette. Sprinkle with almonds. 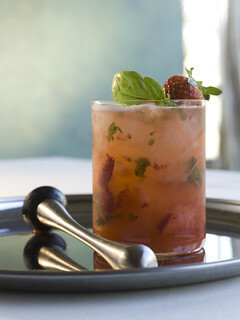 Fresh basil lends a fun flavor note to the classic combination of strawberries and lemonade. Soda water introduces a lively sparkle. After a busy winter and spring we are happy to welcome some summer sunshine and have lots of exciting projects and trips on the horizon. Here is a little of what we have been up to since our last newsletter. Since my trip back from Ukraine, I had about a week to relax at home before heading out again. This time my travels lead me to Ocean Shores, Washington to host the 6th Annual Razor Clam Festival! Ocean Shores is a small beach town on the coast of Washington; about a 3-hour drive away from the hustle and bustle of Seattle. Every year they celebrate this illustrious clam with a fun and tasty festival, from Blood Mary and beer booths, to arts and crafts, and of course a clam chowder cook-off. My team and I judged both the amateur and professional chowder cook-offs and seriously tasted over 45 chowders to choose the grand prize winners. Needless to say we were stuffed to the gills with chowder by the end of the day! 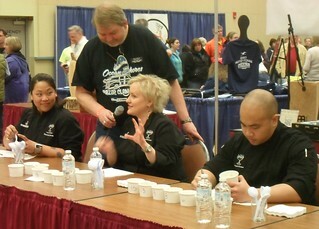 Heather, Erwin and I tasting the first group of chowders! Then it was off to California’s Napa Valley with teammates Heather and new sous-chef Jason for the Flavor Summit! Held at the prestigious Culinary Institute of America at Greystone, this industry-only event brings in the top leaders in the culinary world to discuss and taste their way through flavor-related topics. The campus is amazing and the seminars were enlightening! I attended with my client Paramount Citrus. We participated in the lunch, cooking up a Sweet Orange, Fennel and Arugula Salad with Citrus Grilled Shrimp and my Market Fresh Lime Agua Fresca with Berries (see below for the recipe). For the ending reception we crafted Liquid Kitchen Ultimate G & T’s (Gin and Tonics), topped with a Cucumber Lime Foam and a grating of lime zest. Squeezing out some Paramount Limes for my Ultimate G & T! Then it was off to Los Angeles again. This time for business meetings mixed in with some fun. While in LA, we checked out concepts and visited restaurants, including Bottega Louie where I was drooling over their amazing pastries and cupcakes. 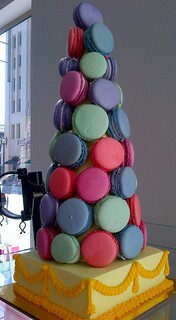 Check out the Macaron Tree below! The weekend was full of glitterati sightings at the SLS hotel in Beverly Hills where party goers for JJ McKay’s (Seattle party host extraordinaire) party were staying. JJ’s parties always bring in the who’s who of crowds and lead to the best networking ever. Guests flew in from all over the US, including partiers from Miami and NY to Dallas, San Francisco and Seattle. Next stops: I’m off to Vancouver, British Columbia this week for work with the Fairmont Hotels and then New Orleans, Louisiana and Washington, D.C. Stay tuned for more tasty travel round up’s on my blog. Filming for the 3rd Season of Kathy Casey’s Liquid Kitchen™ just wrapped up with Small Screen Network. We filmed 18 episodes in two days! Vitamix was our main sponsor this season and so expect lots of amazing, blended summer drink episodes, like my Liquid Indulgence (vanilla ice cream, espresso and salted caramel incorporated together and topped with a float of mezcal!) and a Blended Peach Whisky Sour! 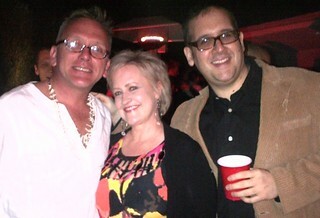 A Seattle LUPEC member was the top bidder to be a guest on Liquid Kitchen at a recent breast cancer fundraising event. So in honor of the ladies who love to imbibe I created the Green Goddess for an episode – Green Chartreuse, egg whites, fresh pineapple, silver rum, a touch of lemon and Bitter Truth Celery Bitters – yum! Stay tuned for these new episodes to be posted soon! Special Guest and LUPEC Seattle member Lynn Becker and I shaking up a Green Goddess Cocktail! If you follow me on Twitter, then you may have caught wind that I just finished the recipes and am now shooting the photography for my 10th cookbook… all on deviled eggs! Stay updated with Twitter on my book’s progress as I tweet more behind the scenes of our photo shoots. 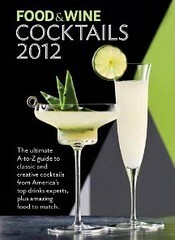 The new Food & Wine Cocktails 2012 book is out! This year I share my creative versions of the ever classic French 75. This cocktail book covers an extensive array of classic cocktails with featured mixologists’ personal variations. How about a Salted Maple (a Pisco Sour variation) or a Lord Bullingdon’s Revenge (a Sazerac spin)? There are also non-alcoholic options too! Make sure you get your copy today! If you’re a frequent flyer, check out this special promo from Amazon.com. Free Wi-Fi access to Amazon.com on most Delta flights. Click here for more info. Faboo! 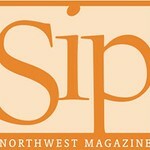 And don’t forget to check out Sip Northwest magazine for all you Pacific Northwest imbibers, including bars to sip, recipes to make, and new spirits to taste. Here’s a sneak peak on one of my articles. You can also pick up a complimentary copy at my Dish D’Lish cafés at the Seattle-Tacoma International Airport. New restaurants are popping up everywhere, but one of my new faves is Chef Greg Atknison’s Restaurant Marché located on Bainbridge Island, Washington. Greg is one of my all-time favorite chefs and I am so happy for him and his wife Betsy. The restaurant and menu totally embodies Greg’s signature style and flair. I enjoyed my recent birthday dinner there with the hubby and friends and was swooning by the time I left from total culinary bliss. If you have a trip planned to the Pacific Northwest or are a local be sure to make reservations and check it out. It’s a quick ferry ride across the Puget Sound and is close to the ferry terminal. Marché is open for lunch and dinner on Tuesdays – Saturdays. The menu changes with the seasons, featuring northwest cuisine and island goods (think amazing wild greens, crisp oysters, smooth-as-silk-chicken liver pate you want to rub on yourself!). Take a peek at this season’s menu items. Bainbridge Island’s newest hot spot! Cook Up Some Fun with Paramount Citrus! Fill a large tall glass with ice. Add the citrus juices and the Zesty Lime Syrup. Add soda water and stir. Top with Market Fruit Topping. Garnish with lime zest. Combine the zest, sugar and water in a small saucepan. Bring to a quick boil over high heat. Boil for 1 minute then remove from heat and let cool. Store refrigerated for up to 3 weeks. Mix ingredients together. Store refrigerated. 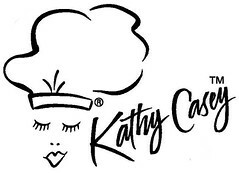 Follow on Twitter @KathyCaseyChef. Blogging: Dishing with Kathy Casey. Like on Facebook: Sips & Apps and Kathy Casey’s Liquid Kitchen. Watch: www.LiquidKitchen.tv.